Must-have! 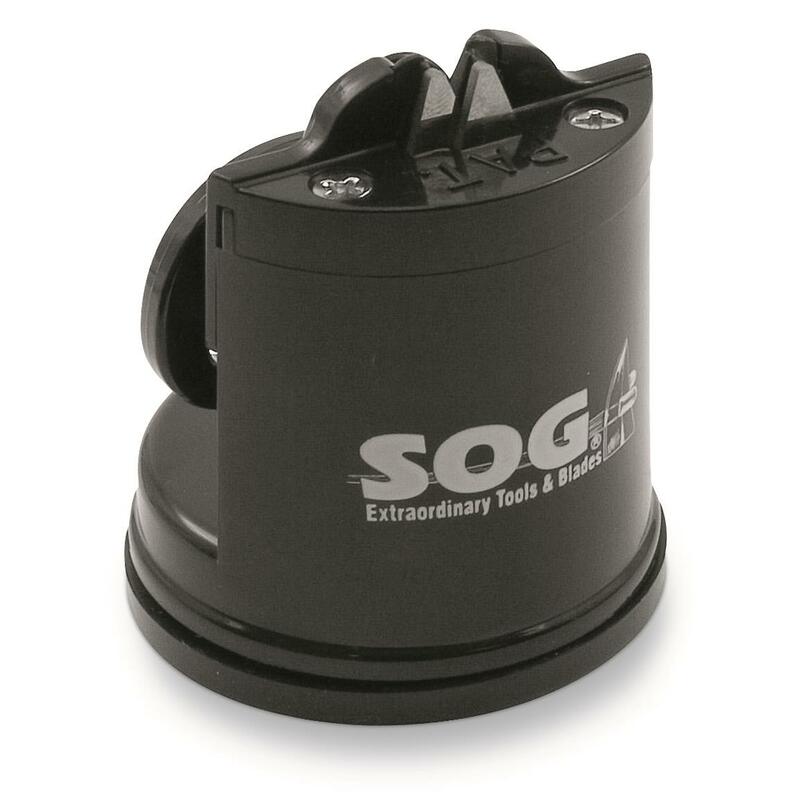 Rely on this newest generation of SOG® Sharpeners to turn dull knives into razor-sharp cutlery tools in a flash. Simply set the Sharpener on any flat, non-porous surface and activate the suction. Just a few passes, and you've got a clean knife edge, just like new! For single or double-edged blades. 2 1/2" x 2 3/4"h. Weighs 3 ozs. 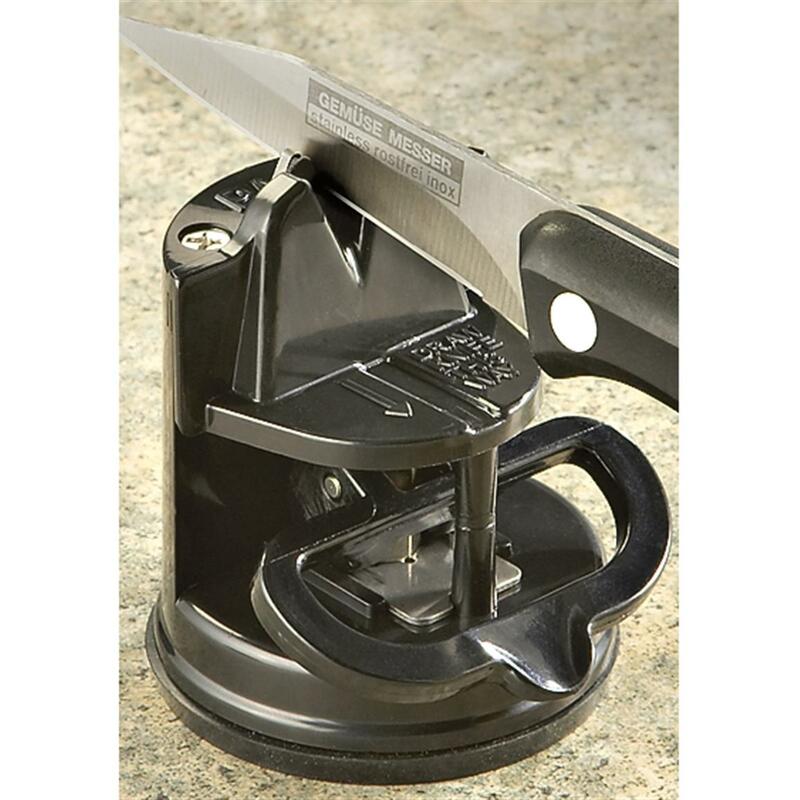 SOG Countertop Knife Sharpener is rated 4.8 out of 5 by 66. Rated 5 out of 5 by Denvernic from Works great Works great sharping all my knifes and small enough to take with on my hunting trips so I can sharpen them if needed while skinning out a deer. Rated 5 out of 5 by Pineapple from SOG sharp!! Bought the SOG sharpener 3 weeks ago. Now all my knives are sharpened. Within minutes!!EFORTLESSLY!! Rated 4 out of 5 by Rich K from Really works well I haven't had this for long but it definitely has brought a couple of kitchen knives back from the dead quickly and simply. Affixes firmly to the kitchen counter and a few swipes through and you're done! Bought it on Flash Friday too. Definitely worthwhile. Rated 5 out of 5 by Oldturtleguy from So far good. So far it has been good. It has a very secure vacum seal and it sharpens nicely. Rated 5 out of 5 by Tavita from Works great! Great job on sharpening dull knives! Better used for good quality blades/ pocketknives rather than cheaper knives like my kitchen knives. Improved every knife that I tried to sharpen!! Rated 5 out of 5 by Dgross504 from Easy to use for anyone Very easy for most anyone to use even if you have never sharpened a knife before. Works well on almost any straight blade knife. Rated 5 out of 5 by jrwtexas from It is exactly as advertised Purchase to keep knifes sharpened. After the first use, it is exactly as advertised. Works fast leaving a nice sharp edge. U.S. military inspired survival tech. On-the-go firearm maintenance made easy.